There has been an outbreak of measles and the school was closed for 3 weeks. Miss Steele is leaving the job of infants teacher through ill-health. Mr Ormerod is leaving as the organist to be replaced by Frederick Lloyd. It is the year of the Queen’s Jubilee and celebrations included a fireworks display. Sir Augustus and Lady Adderley hosted a fete and Church Avenue was illuminated. The permanent memorial in the church for the Jubilee was the reredos. The prizes at Worfield Grammar School were announced. 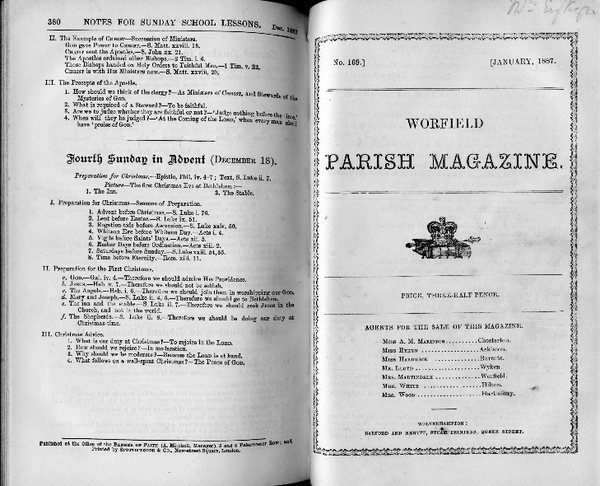 Worfield and its Townships has just been published. The church clock cost £200 not the £50 stated.